Mostly, anyway. I believe I have a few lingering boxes, 2 small ones in the kitchen and maybe 3 or 4 full of toys in the kid’s rooms. You may be wondering how my kids let me get away with that one. Three words… Deluxe. Kiddie. Pool! They don’t even care that they only have a handful of toys out. The only thing they want to do is hop in the pool. Good thing it has been so hot lately. Eventually I will build another white bookcase to replace the particle board one on the left. Too bad I don’t have my BFF nearby anymore (wah) so I can borrow her husband’s planer again. 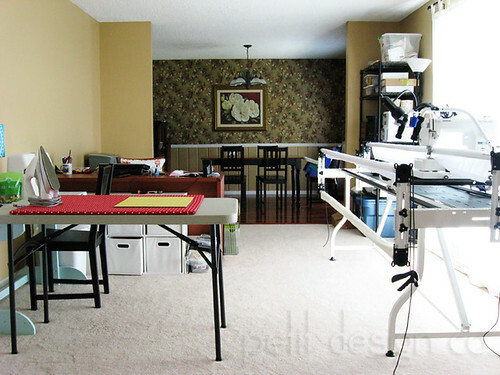 I also plan on putting up some curtains as a room divider - at least on the end where the dining room is. (I need to center that painting because it’s bugging me. I stuck it on the wall on an existing screw to get it out of the way. I think it’s too low and too far to the left. I love the wood floors in there!) Ha ha, when I first took the picture of the other side the piano wasn’t centered either, so I shoved it over and took the picture again. Moving the piano is actually a lot easier than finding a hammer, a measuring tape, a drill, and some wall anchors to center the painting! I also want to add more decorative hoops to each side of the clock. I haven’t hung my collection of mini quilts yet, but I think those will go on the wall above the big brown desk. Yup, I feel settled in now that my creative space is set up. I even dug out a UFO and threw it up on the design wall! PS. I want your opinion! The area where the piano sits is actually a hallway/foyer. The front doors (yes it’s a double door) are to the left of the piano. We don’t use the front door very often. Do you think it’s weird to have a piano there? I think the area is about 6’ deep so there is plenty of walking space around the piano. Once school starts I may decide to put the cubby system there and move the piano to the family room. I actually kind of like the idea of having the piano there so that my kids can actually focus when they are practicing instead of being distracted by the TV, toys or their siblings. I think that is a good place for a piano. Practice is not distracted PLUS it doesn't bother others as much. Glad you're getting settled in. The kiddie pool sounds like fun. 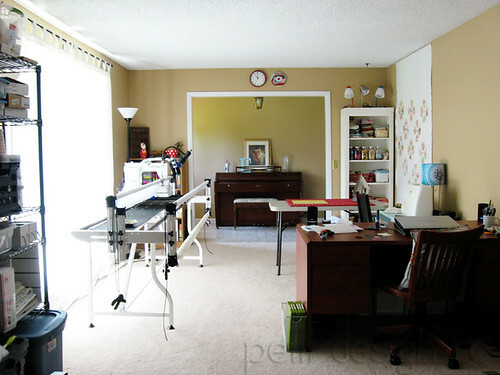 I love the big bright space for your craft room. Enjoy it! The house looks lovely. The space is amazing! I love the light coming in the windows. I miss my quilting buddy.